BO156. 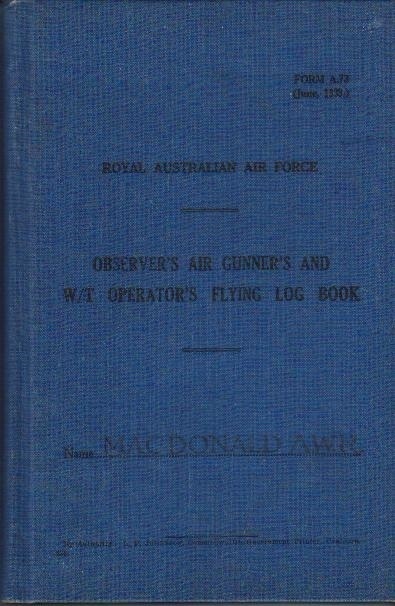 An Observers Air Gunners and W/T Operators Flying Log Book named to Macdonald A W R. The book starts on 8 May 1943 and finishes on 27 Jun 1943 at No 1 Air Observers School Cootamundra NSW. BO323. 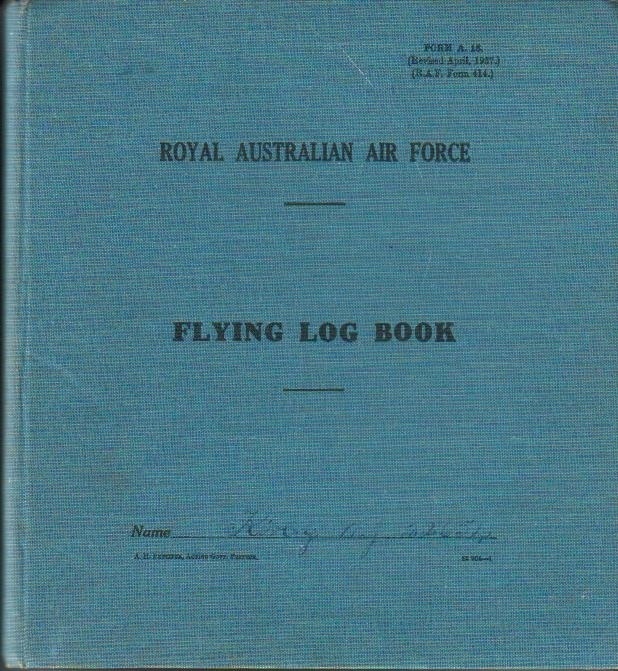 A Flying Log Book named to 22654 Nelson John Kirby who enlisted on 10 Jun 1940 at Brisbane and discharged with the rank of Flight Sergeant on the 7 Mar 1946 from 99 Squadron. Any active pages have been removed. BO324. 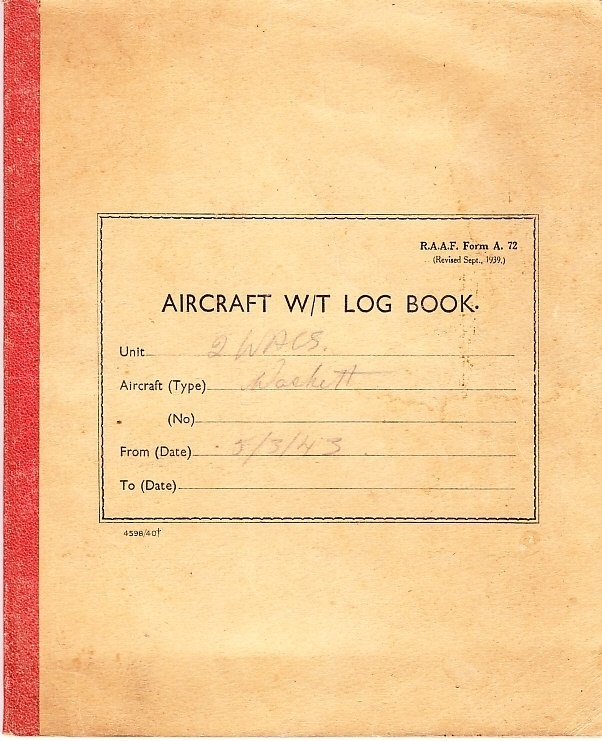 A Flying Log Book dated 1937 in unused condition. BO325. 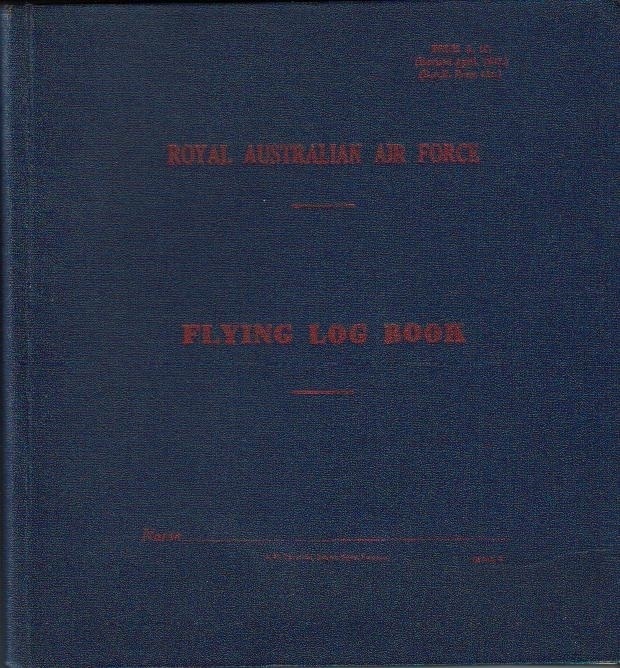 A Flying Log Book dated 1937 in unused condition. BO330. 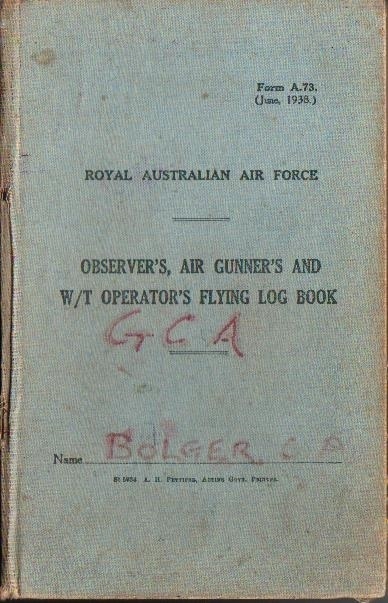 An Observer's Air Gunner's and W/T Operator's Flying Log Book named to Bolger C. P. The book starts on Feb 1961 and finishes on 1 Jul 1971. BO331. 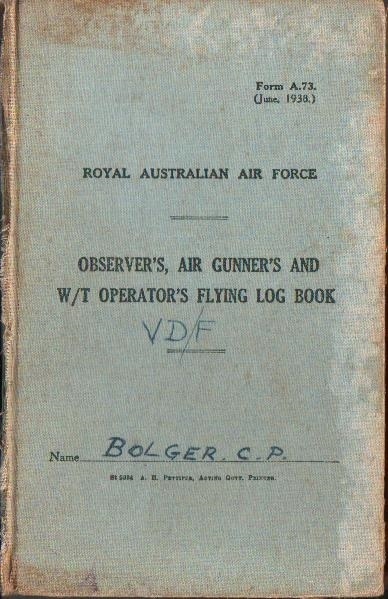 An Observer's Air Gunner's and W/T Operator's Flying Log Book named to Bolger C. P. The book starts on 1 Jun 1965 and finishes on 2 Mar 1972 at Amberley . BO332. 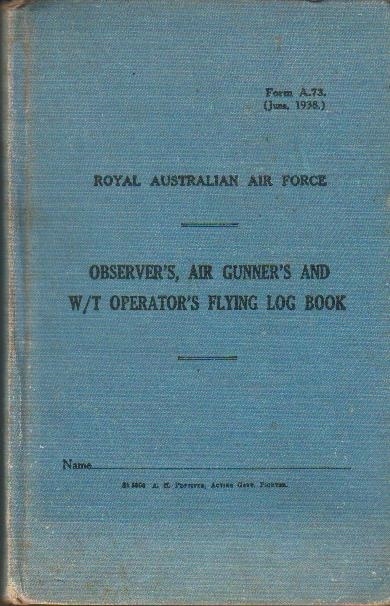 An Observer's Air Gunner's and W/T Operator's Flying Log Book named to Bolger C. P. The book starts on 1 Dec 1951 in training and finishes on Jan 1961 in Butterworth. BO353. An Observers Air Gunners and W/T Operators Log Book named to 131942 Walter James Scribner. The book starts on 31 Mar 1945 and finishes on 3 Apr 1945 at No 3 Bombing and Air Gunnery School West Sale VIC. BO401. 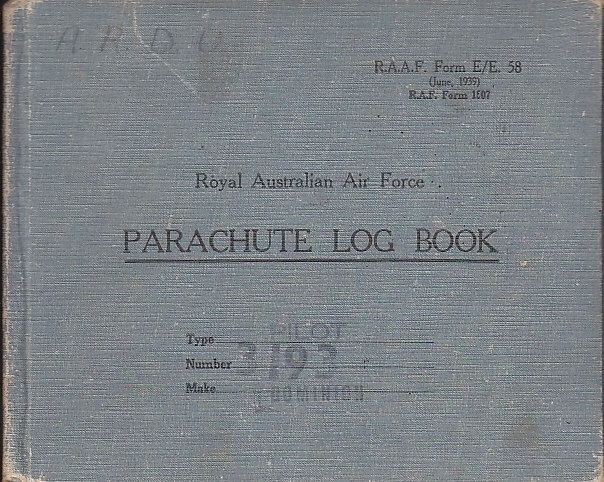 A Parachute Log Book dated 1939 for Dominion Pilot parachute 3193. 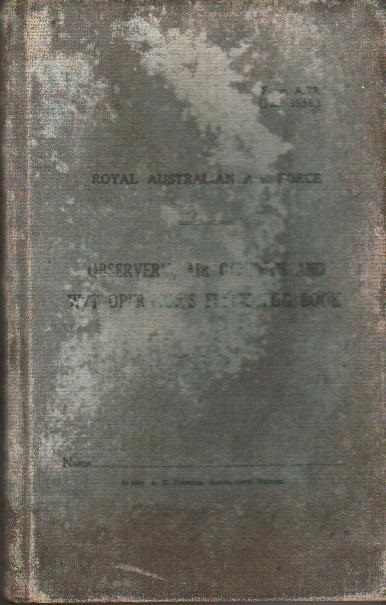 The book starts 29 Oct 1952 and finishes on 18 Aug 1960 at No 2 Aircraft Depot Richmond NSW. BO557. 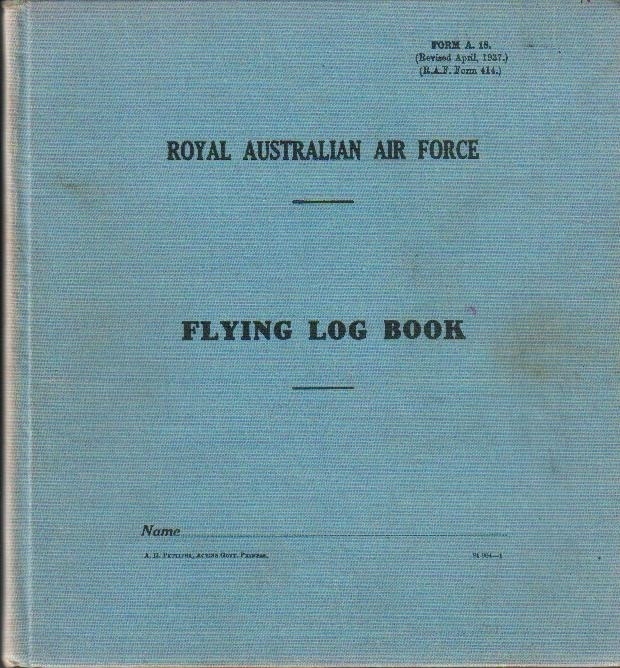 A Flying Log Book named to 433148 LAC William Youngberry at No 10 Elementary Flying Training School at Temora NSW. William enlisted on 25 Feb 1943 at Lismore and discharged with the rank of Flying Officer on 4 Feb 1946 from No 2 Squadron. BO612. An Observers Air Gunners and W/T Operators Log Book that is unused. BO876. 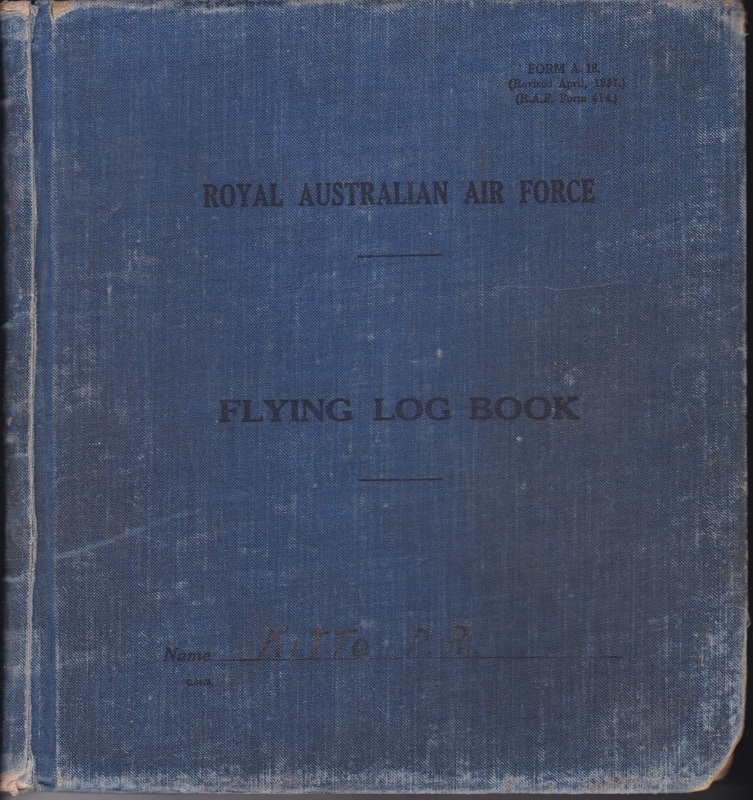 A Flying Log Book named to Kitto P. R. Peter Rex Kitto enlisted on 28 Apr 1941 at Adelaide and discharged with the rank of Flight Lieutenant on 1 Oct 1945 from 7 Service Flying Training School. 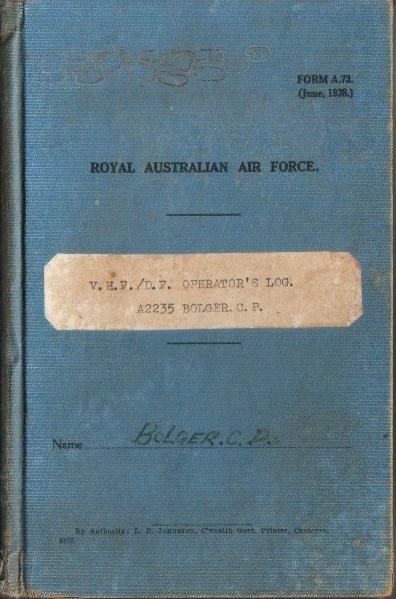 This book starts on Jul 1941 flying Tiger Moths at No 1 elementary Flying Training School at Parafield and finishes Jun 1944 at No 6 Service Flying Training School at Mallala. BO877. 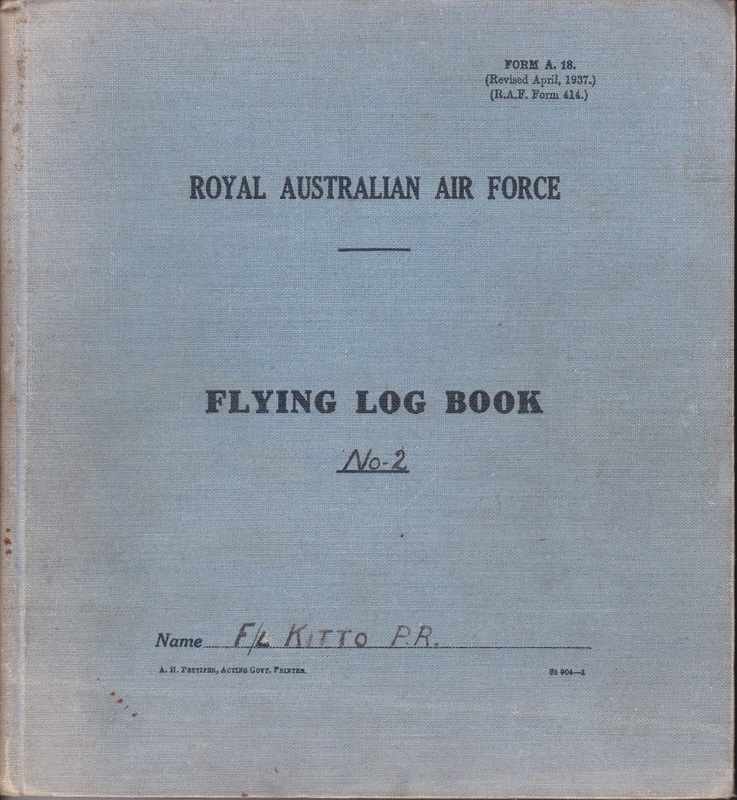 A Flying Log Book No 2 named to Peter Rex Kitto as above. 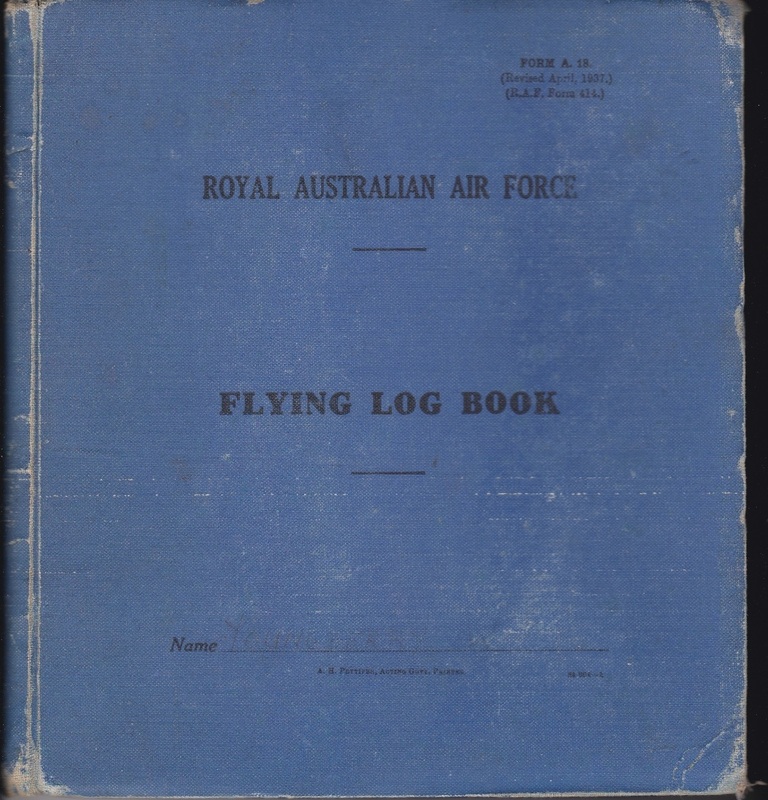 This book starts in 1944 at No 6 Service Flying Training School Mallala and finishes on the 19 Sep 1945 as a flying instructor at Advanced Flying & Refresher Wing at Deniliquin. BO930. 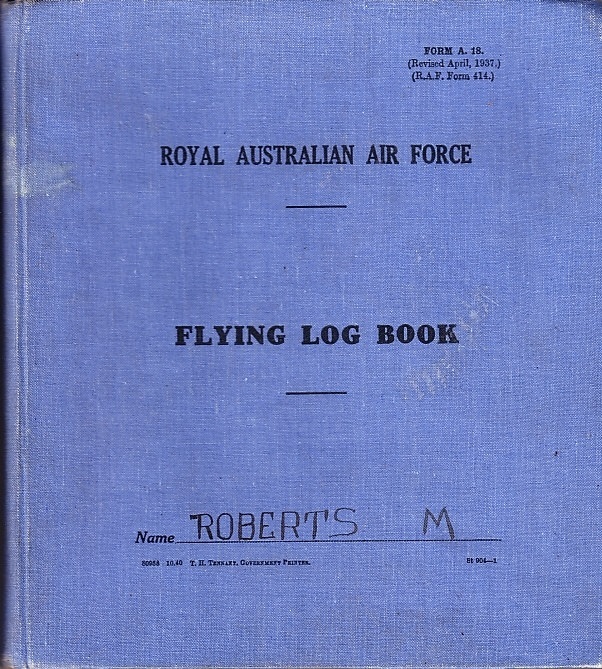 A Flying Log Book named to LAC M Roberts, unfortunately there are several M Roberts that were aircrew. The book starts in 1941 at No 5 Elementary Flying Training School at Narromine and finishes on the 7 Nov 1941. BO931. An Aircraft W/T Log Book dated 3/3/43 for various Wackett aircraft on exercises at No 2 Wireless Air Gunnery School Parkes NSW. BO943. 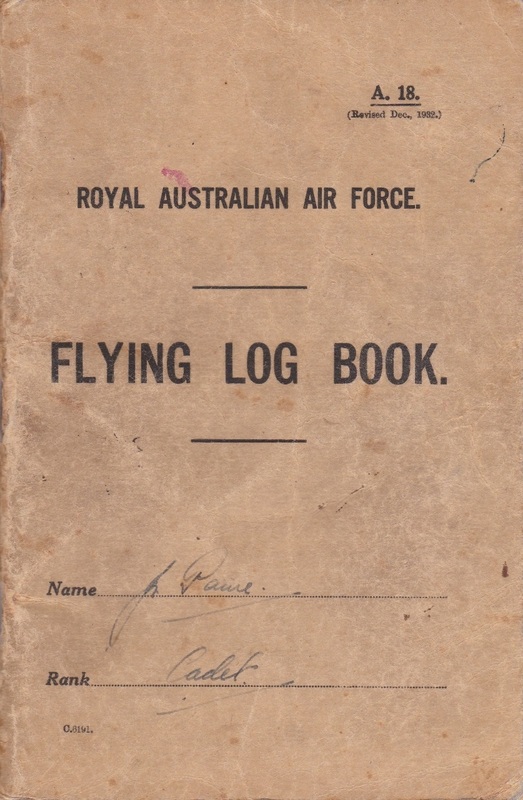 A Flying Log Book dated 1932 named to Cadet Paine. The book starts on 31 Jan 1936 and finishes on 16 Aug 1938. BO944. 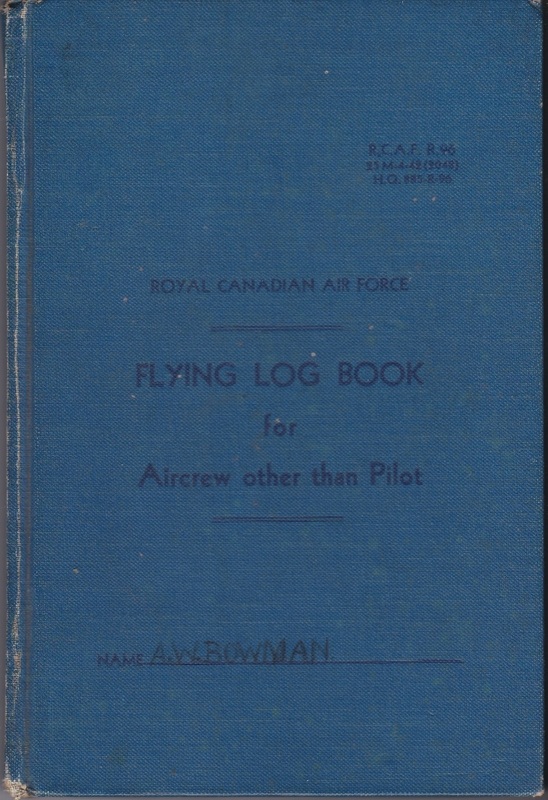 A Royal Canadian Air Force Flying Log Book named to 438977 LAC Bowman A. W. who qualified as a Bomb Aimer Navigation on 6 Oct 1944 at No 1 Air Observer School Malton Ontario Canada. The book starts on 23 Jun 1944 and finishes on 26 Jul 1945. BO945. 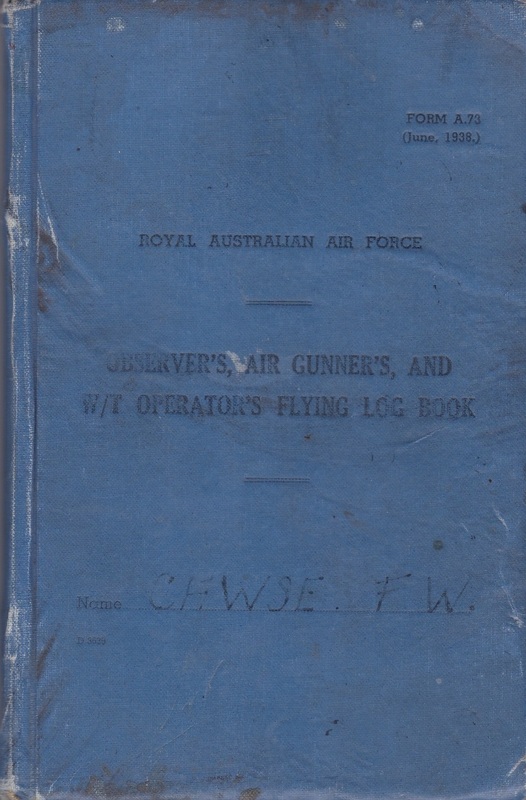 An Observer's Air Gunner's and W/T Operator's Flying Log Book named to 42178 Cawse F. W. who qualified as an Air Gunner on 7 Jul 1944. The book starts on 9 Jun 1944 and finishes on 25 May 1945. BO946. 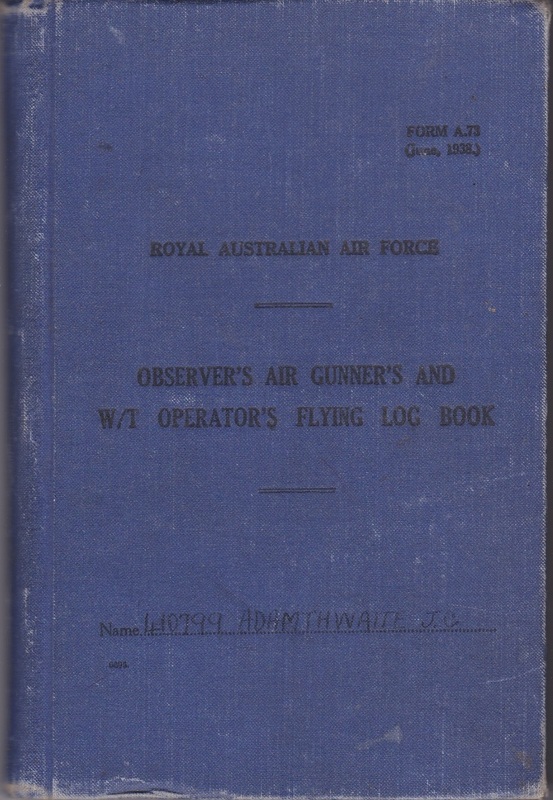 An Observer's Air Gunner's and W/T Operator's Flying Log Book named to 410799 Adamthwaite J. C. who qualified as a Navigator and Air Observer in 1942. The book starts on 2 Jun 1942 and finishes on 31 Jul 43. BO947. 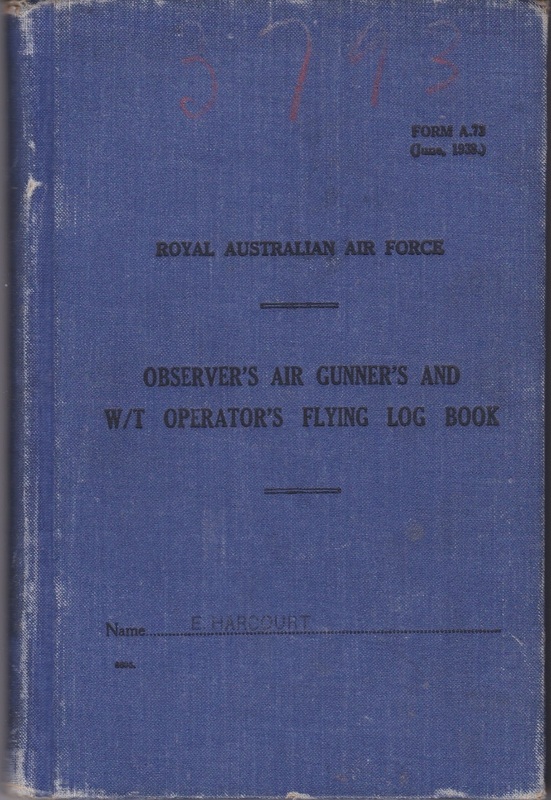 An Observer's Air Gunner's and W/T Operator's Flying Log Book named to 418269 Harcourt E. C. who qualified as a Navigator (Wireless) and an Air Gunner in 1943. The book starts12 Feb 1943 and finishes on 12 Apr 1945.